A young lady in Healdsburg approached me and asked, “Excuse me, but are you famous?” You will not therefore be surprised to learn, dear reader, that I like this pretty little town. It is in the Russian River Valley, part of California’s wine country; it is part of the prestigious Relais & Chateaux organisation; and it is, without doubt, one of the most discreetly elegant small hotels in the United States. It astonished me to discover that it was built in 2005, for it gives every appearance of being an 18th Century French town chateau. I should therefore salute the members of the eponymous Mars family, the first owners, who caused this model of good taste to be erected. They did a considerable service both to Healdsburg and to those many visitors of means and refinement who have subsequently lodged here. Among whom, I am pleased to say, I am now one. 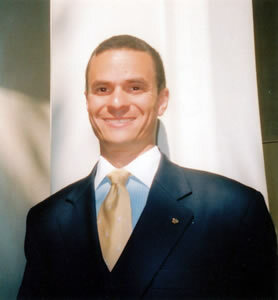 Upon entering, I was greeted immediately by the General Manager, Ramon Serrano (pictured). He was conspicuous by his presence throughout my visit, and went to enormous lengths to ensure that everything was done to make my stay comfortable and enjoyable. (I observed that he did exactly the same for all the occupants of the hotel’s 16 rooms.) He set the tone, and it was a tone of courteous efficiency – which is exactly the tone I like. Antiques from the 17th and 18th Centuries decorate the hotel’s public spaces. But such period pieces live in total harmony with all the modern conveniences one expects at a luxury hotel in the 21st Century. A symbol of this happy relationship can be found in the electric candle lights throughout the building. Their ‘flames’ move, for they are attached to stems which are agitated by tiny electro-magnets. I happen to know about these lights, which are made in Holland, because I began to use them twenty years ago, after I encountered them in The Georgian House in Edinburgh. That they are in use at the Hotel Les Mars says much about the owners’ attention to detail. Another example gave me equal delight. There was air conditioning in my bathroom. I have searched my memory, but I cannot recall ever before encountering an air-conditioned bathroom. Of course, all bathrooms are heated and most have some sort of air extraction system, but air conditioning? No. And, I must say, it was absolutely delightful. As was the rest of room 203. This was on the 2nd (what we British would call the 1st) floor. ( I will not attempt to give you a price, as there are numerous offers and packages available, so I must advise you to check for specific dates on the hotel’s website.) The immediate impression is wonderful, because the door from the corridor is of grand proportions and is made of highly polished mahogany. 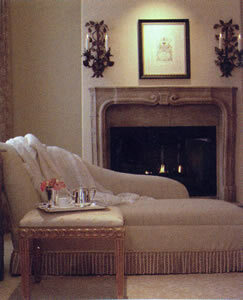 Once inside, the L-shaped hallway led into a bed-sitting room (pictured) of beige, yellow and gilt. 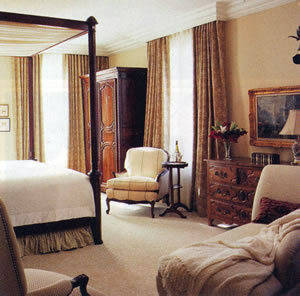 The period theme was maintained by its handsome furniture, including a writing desk, a wardrobe and a chest of drawers. On the walls were engravings of bewigged gentlemen a-horse. A stone mantelpiece with a flaming (gas) fire provided a pretty focal point. The bed was a four poster, with delightfully silky linen. Three table lamps, spotlights and wall lights (with those moving ‘flames’) provided restful lighting. In the bathroom grey and white marble lined the floor and the walls up to the dado rail. There was one wash basin, a good tub (with an agitation facility), a walk-in shower and a loo. The towels were by Frette and the toiletries by Bulgari. The wall lights and the spotlights were all dimmable. Everything in the bathroom – as throughout the whole apartment – was spotless. At the time of my visit, there was no hotel restaurant, although one is planned in the near future. I found this no inconvenience at dinner time, as Les Mars is only one block from the main square of the town, which is full of eateries of different sorts. It did, however, mean that I broke the morning fast in my room. Still, I had enough to sustain me until the luncheon hour, with orange juice, coffee, brioche, muffins, fresh fruit, bacon, sausage, tomatoes and poached eggs – all of good quality. By now you will be anxious to know the answer I gave to the young lady’s question. It was rather non-committal, I fear. “Are you famous?” “I don’t really know” is all I said, and left her with her thoughts. But I do know about the Hotel Les Mars. It is an exquisite jewel in a pretty setting. 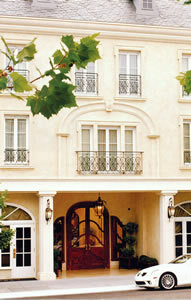 27 North Street, Healdsburg, California 95448, U.S.A.